The Lowe FM160 Pro is such a brand new model for 2014 that it didn’t even make it into the 2014 Lowe catalog so you’ll have to check it out online or better still, at your nearest Lowe dealer. This new boat is one of Lowe’s twelve models in its Deep-V series of fishing and watersports boats from sixteen to twenty-two feet. 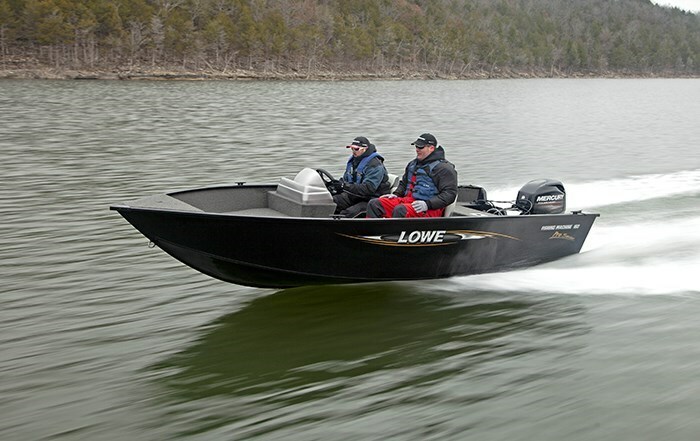 Lowe Boats of Lebanon Missouri was founded by Carl and Dianna Lowe over forty years ago and for 2014 offers sixty-six models from ten to twenty-two-plus feet of aluminum Mod-V bass, crappie, and multi-species boats; a Bay boat; Roughneck hunt boats; Angler utility boats, Jon boats; plus the Deep-V series to which this new FM160 Pro belongs. Lowe also offers twenty models of pontoon and deck boats in five series from nineteen to twenty-five feet. The FM160 Pro is a side console design and at first glance, you may be tempted to confuse it with the existing model FM160 S which is not only part of the Deep-V series but is also a side console and also wears the Fishing Machine (FM) designation. On closer inspection, you will notice that this new FM160 Pro is 16’5” long on a much wider 82” beam and weighs 1,021 pounds whereas the FM160 S is slightly shorter at 16’1” long on a 75” beam and weighs in at a much lighter 711 pounds. Also, the new model is rated for sixty horsepower versus fifty for the smaller boat. 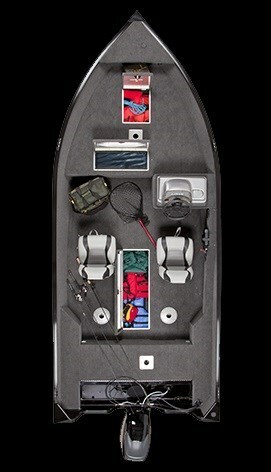 You can also carry one more person (total 6) in the new model and considerably more weight in gear. The all-welded, reverse chine deep-v hull of the FM160 Pro features extruded gunnels plus extruded lifting strakes plus a full length extruded keel and is covered on the interior with 16-ounce charcoal coloured marine carpet throughout. The tidy-sized acrylic side console with tinted windscreen and soft grip steering wheel has an unobstructed flat surfaced front face to allow you to have whatever outboard instrumentation or perhaps even a GPS/fishfinder installed within it. A 12-volt receptacle is provided in the dash as is a cockpit courtesy light. Two black and grey pedestal fishing seats are provided and can be fitted in any of the five seat bases found conveniently located throughout the boat. The driver’s pedestal seat is a locking type and comes with a slider. 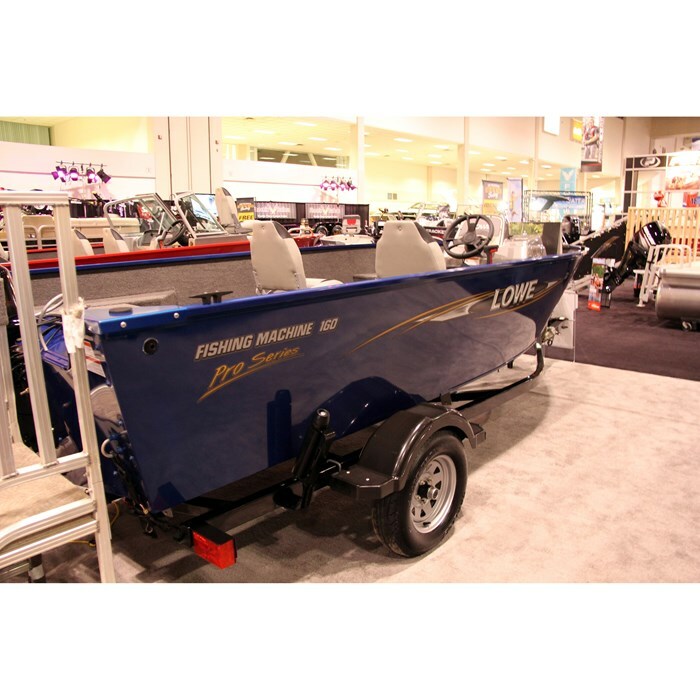 The bow fishing deck is relatively quite huge and contains an 18-gallon aerated livewell plus a separate in-floor covered storage compartment. Small open storage is found under the forward upper bow deck. Your choice of a Minnkota™ PD55 or MotorGuide™ FW46 or even a MotorGuide™ WR55 wireless trolling motor are optionally available to have mounted on this upper deck. 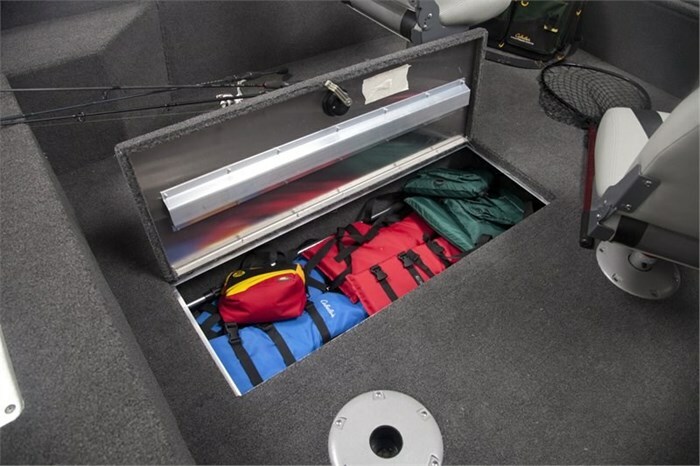 A cockpit in-floor storage compartment is suitable for rod storage up to 8-footers and comes with a rod-end holder. More storage is found beneath the rear casting deck which will also be necessary space for the portable 12-gallon fuel tank and starting battery. If you choose one of the optional trolling motors, you may also want to select the optional single bank battery charger to install in this space back here. There are six optional hull colour choices for the FM160 Pro including Bay Avalon, Blue Flame, Black, Metallic Silver, Red, and Bright White. Similarly, there are six horsepower choices of Mercury outboard motors from 20 through 60 horsepower. The 40 and 60 horsepower choices seem to be offered as the most popular. There are other notable options you may wish to select to provide you with the optimum in fishing enjoyment. These may include a Lowrance™ 5X Fish Finder with adjustable ram mount or perhaps a starboard gear storage box. At the helm, you can add tilt steering and chrome accenting on the steering wheel. 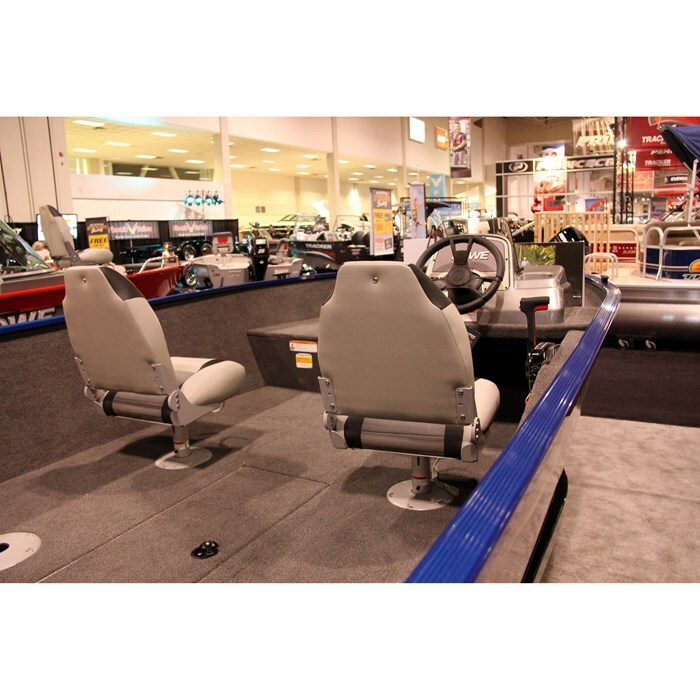 You may want upgraded seating with a Deluxe Centric helm, passenger, and/or pedestal seat, a barrel-type helm seat with slider, or an additional pedestal fishing seat assembly. Handy optional items include a swim platform with boarding ladder, a mooring cover, and a galvanized or painted swing tongue trailer for which you can add a matching spare tire with bracket plus ratchet tie downs.